More and more people look to social media first for news, updates, and customer service help. And your customers are no different. In fact, 42% of users on Twitter expect a response to their customer service issue in under an hour. But after typing out your sixth identical response to a frequently asked question, do you find yourself wishing there was a better way? With Hootsuite, there is. 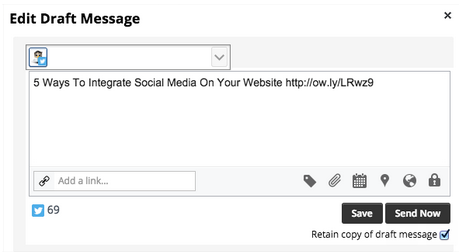 The Draft Message feature in Hootsuite allows you to not only create draft messages, but save those messages for multiple uses. Opening a new location? Retain a draft message with the new information to share whenever someone @mentions you for the address. Launching a new product but waiting on images? Draft your posts and add the pictures later. With Hootsuite’s Draft Message feature, you can save time while ensuring consistent messaging. Here’s how. In the Hootsuite dashboard, first select which social profiles you want to send your drafted message from. Now, enter the message you wish to draft into the Compose box. Next to the Send Now button in the bottom right of your compose box, you’ll see a disk icon. Click this icon to display a drop-down menu. Within the drop-down menu, save your message by clicking Save as draft. To view your drafts, select Publisher and select Drafts. Select the social profile you have saved your draft to from the drop-down menu. To edit your draft, hover your mouse over the draft and click Edit. Click Save to resave the message in drafts. Again, from the Publisher tab under Drafts, select the social profile you have saved your draft to from the drop down menu. Hover your mouse over the draft, and then click Edit. Edit the message if you wish, or simply click Send Now. To retain your draft to use multiple times, check retain copy of draft message before you click Send Now. Note: Sending or scheduling a draft will remove it from Drafts unless the Retain copy of draft message box is checked. Start creating you own draft messages.